This $328 Coach bag is made with signature fabric and patent fabric trim. It has an inside zip and multi function pockets, zip top closure, outside open pocket and 7" drop handles. 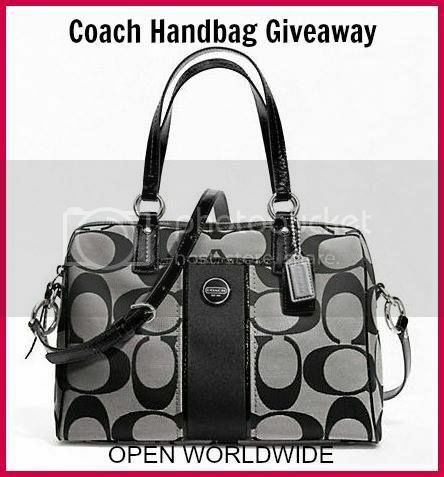 Open worldwide ends on December 18th for one person over 18 to win this Coach Bag. Use the Giveaway Tools widget below to enter the giveaway. This giveaway is hosted by Diva Fabulosa & Beauty and Fashion Diva to bring cheer to the holidays. Confirmed Winner will be contacted by email and have 48 hours to respond before a new winner will be drawn. No purchase necessary. Void where prohibited by law. The sponsor Diva Fabulosa will be responsible for prize fulfillment. If you have questions about this giveaway please feel free to contact Jade at admin@divafabulosa.com This even is in no way associated with, sponsored, administered, or endorsed by Facebook, Twitter, Google, Pinterest or any other social media network. The disclosure is done in accordance with the Federal Trade Commission 10 CFR, Part 255 Guides Concerning the use of Endorsements and Testimonials in Advertising. My secret word is Fabulosa for today. The secret world for today is Fabulosa. I would wish for good health for my family and friends! Thank you for such a wonderful contest and opportunity! I don't own one yet...but would love a Coach bag. That bag looks really nice. :) Are we suppose to comment with the word of the day? "Fabulosa"
When I clicked the link, I came to the secret word of the day, Fabulosa. I'd wish for my kids to grow up being happy and healthy. I would wish that both my sons always be best friends!